Galileo’s middle finger…. one of several of his digits at the museum. Did you know that it took the Catholic Church 350 years to admit that it was wrong to persecute him for saying that the earth moved around the sun? We were in Italy over spring break, and while we were in Florence, we stopped at the Galileo Museum. What a marvel. Telescopes so large that rigging and maneuvering them required advanced engineering skills. Wooden slopes and arcs used to discover/ demonstrate principles of acceleration. Also: life-sized sculptures of fetuses near term, apparently used to show 18th century obstetricians how to deal with birth complications. 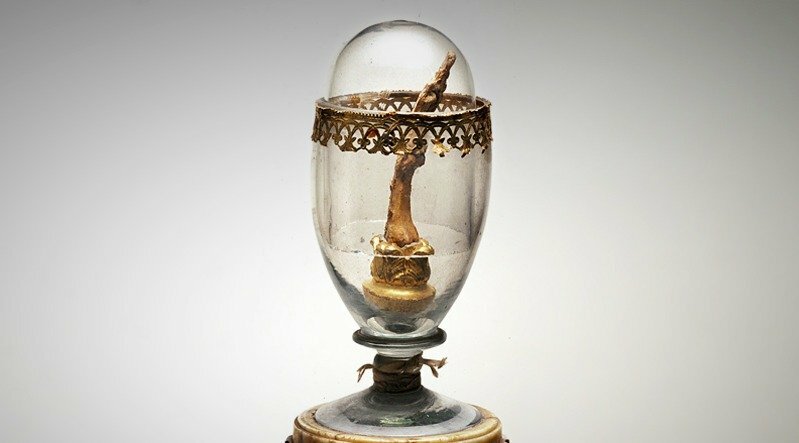 Almost as freaky: Galileo’s fingers in a kind of bell jar. Our seven-year-old— let’s call her Cat— was fascinated most by the interactive stuff, and then, to no one’s surprise, the gift shop. On the eve of our flight home, we discovered that a little baubly box from said gift shop had found its way into Cat’s suitcase… though none of us paid for it and, in fact, one of us had told the child that she couldn’t have it. It was palpably painful for little Cat to take responsibility for the situation, even when we agreed that it was an accident. I understood her pain. It can be hard, when you’re a seven-year-old child, to say you’re sorry. It should not be hard when you are a septuagenarian senator. But when it comes to reparations for slavery, Republicans who grew up in the Jim Crow South are crying in ways that Cat would find beneath her dignity. “I think it’s too remote in time,” said Sen. Lindsay Graham (R-SC), of Sen. Cory Booker’s (D-NJ) proposal to study reparations for the descendants of slaves. “I don’t think anybody ― black or white, man or woman, whatever your nationality ― is responsible for what somebody else did, somebody else, black or white, did 150 years ago,” said Sen. John Kennedy (R-La. ), reportedly. Do I really need to spell this out the way we had to spell it out to Cat? Okay. It doesn’t matter, Senator, whether you enslaved people or not. You benefitted— you do benefit— from the spoils of slavery. You built your power base and secured your taxpayer funded sinecure on the legacy of slavery, aka white supremacy, in its multitudes of incarnations: Jim Crow, red lining, white flight, racism in policing and sentencing, gentrification, etc. I could go on and on and on. You’ve got that little box from the gift shop in your pocket, but you didn’t pay for it. Should we undergo the painful inquiry as to how that box got into your pocket? Whether it was your fault, or your daddy’s fault for not checking your pockets, or your great-great-granddaddy’s fault? No. You don’t want that. Instead, you should just give it back— along with an apology and a donation— and be grateful someone gave you the opportunity to make a humble and inevitably inadequate attempt to repair the most monstrous of the sins our country was built on.